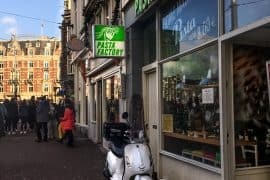 When family came to visit last month my partner Bogdan spent a lot of time putting together a list of Amsterdam points of interest: good restaurants, shops, local attractions etc. 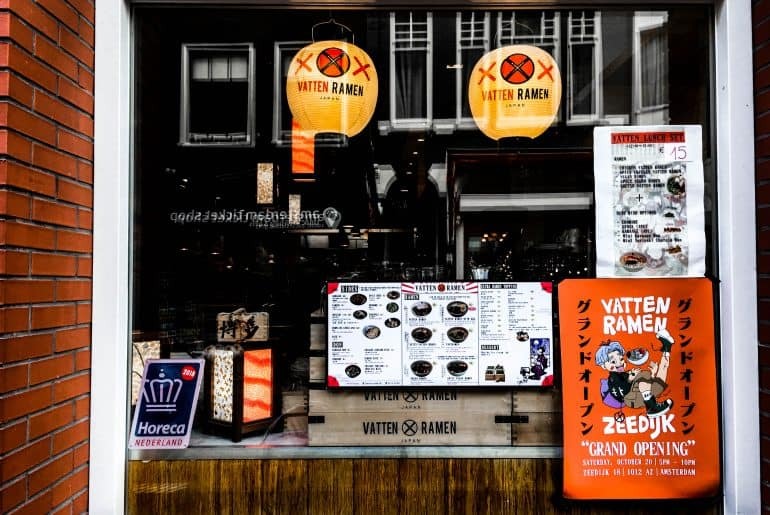 He came across newly opened Vatten Ramen when looking for good ramen places in Amsterdam and added it to the list. One evening after drinks at de Kroon in Rembrandtplein, we were close enough to walk over for dinner. Five of us ordered the signature dish vatten ramen. We all opted for the addition of a marinated egg and shared the karaage aka. deep fried chicken and the takoyaki – pillowy balls of dough filled with minced octopus and served with a topping of mayonnaise, aonori (dried seaweed flakes) and dried bonito shavings. The first spoonful was transcendent. It’s rich, thick and flavourful. It seems to stick perfectly to the curly egg noodles so that with each bite you get a mouthful of broth and noodle in perfect harmony. The marinated egg was cooked very well (maybe a little under but just slightly) and I enjoyed the addition of the black fungus – it was more mellow in flavour than other types of mushrooms but added a nice textural element. The chicken breast in the ramen could have been a little more inspired but overall it was a great bowl of soup. Admittedly, it was my first real ramen experience. I was familiar with ramen of course. I had made it at home, scratch made broth and all. But having the real deal prepared by actual chefs (from Japan no less) felt like a gastronomic right of passage. The karaage was crispy on the outside and juicy on the inside. The takoyaki was soft and flavourful. The ambiance was warm and the sake was flowing. Plus, there’s a full blown Japanese style automated bidet in the bathroom – heated seat and all. Overall Vatten Ramen was a great experience on our first visit. So earlier this week when I had a lunch date with coworkers on a bitterly cold and blustery day, Vatten Ramen seemed like the perfect place. On my second visit to Vatten Ramen I had more time to observe. In the clear light of day without the help of copious amounts of sake I figured I might end up with a more objective appraisal. Plus I needed some pictures. Inside is unassuming and sort of cozy. 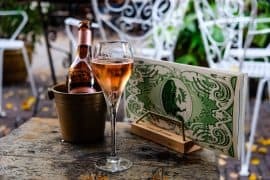 A few well placed decorative elements – red and white paper lanterns, wooden crates, bamboo wallpaper and framed Japanese woodblock prints on the walls – come together to convey a vibe somewhere between an Asian greasy spoon and a hipster bar. The menu is pretty simple. 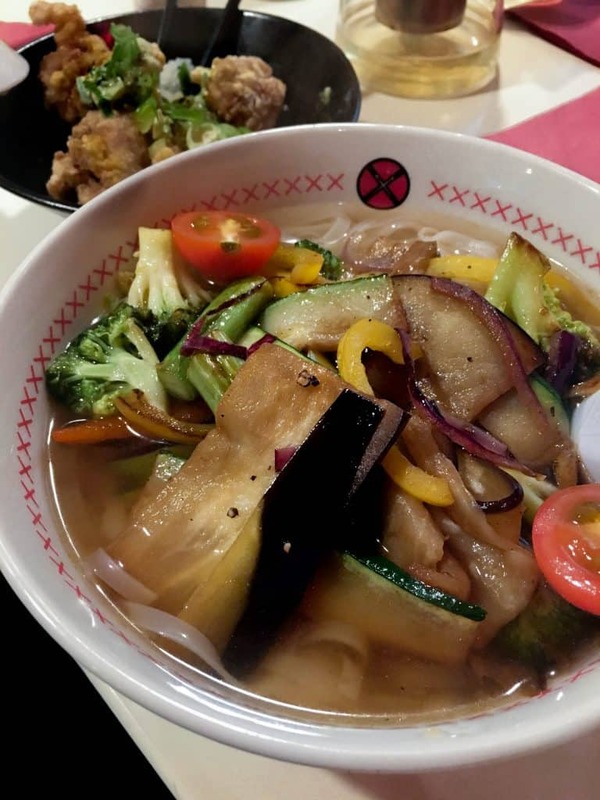 Basically 6 ramen options: the vatten ramen, the vatten ramen with egg, the spicy vatten ramen, the vegan ramen, the spicy vegan ramen, and the cheese ramen (weird – wild card?) 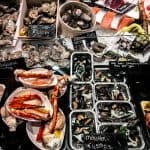 They range in price from €13 to €15 – definitely on the pricey end for a bowl of broth and noodles that they don’t make in house. 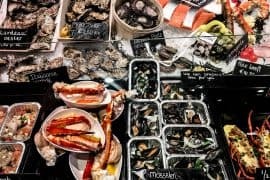 These basic options can be spiced up with 17 toppings ranging from classic ramen staples like corn and butter and spring onion to modern variations like cheese and grilled vegetables – but each topping can cost from 0 to €5 so you could end up with a pretty expensive bowl of soup if you go all out. I was a little disappointed to learn on my first visit to Vatten Ramen that the broth was made with chicken. Traditionally ramen was defined by the type of base it’s made with. There are four generally recognized categories: shio (salt), shoyu (soy sauce), miso (fermented bean paste), and tonkotsu (pork). Of course there are going to be a lot of regional variations and I’m sure someone is making chicken ramen somewhere in Japan – I just really wanted to try the classic tonkotsu. Since all of the meat based ramen at Vatten Ramen is made with chicken bones I decided to try something different on my second visit. I’m not vegan but I really try to eat 80% plant based (both for health and for sustainability) so I decided to give the vegan ramen a try…even though I had some serious reservations. It was…okay. As someone who cooks and loves food I know that there are a ton of ways to get rich umami flavor out of vegetables. Roasted mushrooms and tomatoes are well known sources of umami flavor. I was so disappointed to see that they made very little effort with the vegetables in the vegan ramen. The tomatoes were raw. 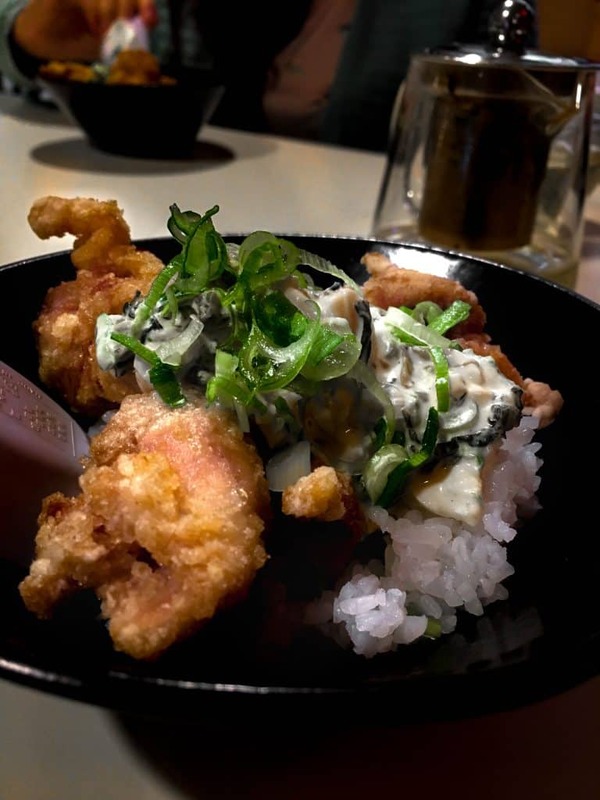 Luckily I also had the karaage don – fried chicken on rice topped with tartar sauce and green onion. It was really good. The next day I asked my vegan friend for her opinion of Vatten Ramen and her reply was really telling. It’s ok. Good not great. 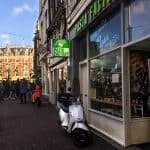 I’ve only had there and Fou Fow on the Elandsgracht and both were pretty lack luster. They just don’t care here yet. I get it. Ramen should be pork or chicken broth…at least it is in Japan. I thought a lot about the way the vegan ramen was prepared and although it wasn’t my favourite meal, it turned out to be a really interesting case study on the evolution of food culture. 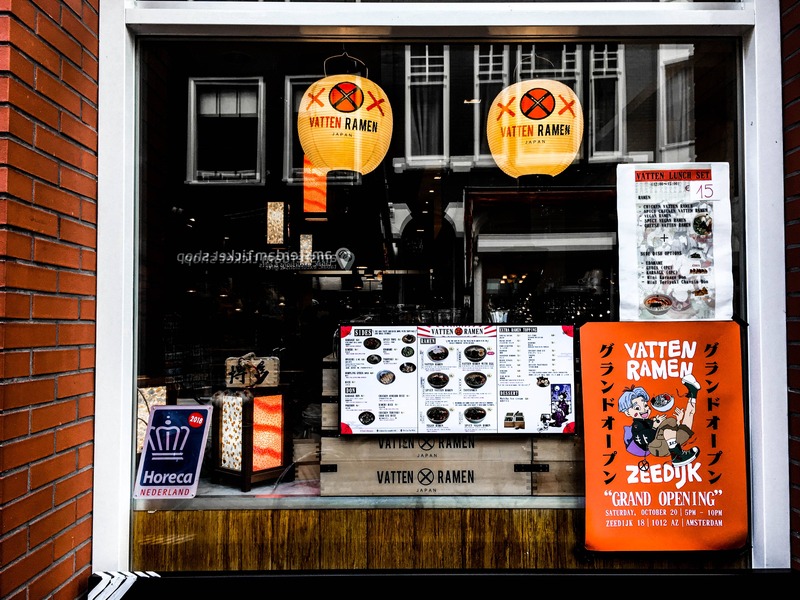 If you happen to be in the Spiegelkwartier or the center and want a good bowl of ramen, Vatten Ramen is a great option…just maybe not for vegans. Personally I think I’m going to make the rounds and try to find that tonkotsu and a proper bowl of vegan ramen. If you want to see the menu at Vatten Ramen you can find it here.